Home › Chart Review › Santos (STO) down 72.65% in one year. Ouch!!! Santos (STO) down 72.65% in one year. Ouch!!! This daily chart extending over the past twelve months of SA based Oil and Gas producer Santos (SA & NT Oil Search) tells the story. Santos is fast becoming the highest profile “casualty” of the falling price of crude oil. But this is not the first time that Santos has had to cope with low crude prices. In 1986 world crude fell to US$10 per barrel, causing Santos to halve its exploration budget. Since the introduction of “fracking” the US has dramatically boosted its own production of shale oil and gas, and is no longer captive to the price demands of OPEC nations with crude reaching US$145 per barrel, in 2008. Critically, Saudi Arabia has refused to cut its production. Should sanctions be lifted on Iran in the coming months, this country could add to the world supplies of crude, further depressing the oil-price. Santos is Australia’s largest supplier of domestic natural gas, and the second largest oil and gas explorer after Woodside Petroleum. The Jackson Oil Field, Australia’s largest onshore oil-field in Western New South Wales. Amadeus Basin in the Northern Territory. The Challis Field, and the Evans Shoal gas field in the Timor Sea. The large Bonaparte gas field off the coast of the Northern Territory and adjacent Western Australia. The Carnarvon Basin with the Talisman Offshore Oil Field, the Legendre, Mutineer and Exeter oil fields, the John Brookes gas field and the Fletcher Finucane oil project. The Surat Basin in Southern Queensland. The onshore Otway Basin and the offshore Gippsland Basin in Victoria. The Oyong and Maleo oil and gas fields offshore, East Java. The Bayu-Undan gas field in the Timor Gap on the border between Indonesia and Australia, which supplies LNG to the Tokyo Electric Power Company. Others fields in Papua-New Guinea, Vietnam, Bangladesh, United States and United Kingdom. The company as announced that MD and CEO for the past 7 years, David Knox, is to step down. The current Chairman Peter Coates will assume the executive responsibilities, conduct a review of operations, and supervise the process for the appointment of a new CEO. There has been much criticism of the failure of the company to hedge its position against the oil price and currency fluctuations, and to write-down depreciated assets. There has also been widespread speculation about what measures might be taken to shore up their financial position in the light or what is looming as long-term low oil-prices, and emerging competition from renewable energy generation, in the face of a need to reduce carbon levels. Santos has stated that it has no plan at present to raise more capital, and that it has over $2 billion in cash and undrawn debt facilities. Production is up 13% in 1H 2015/6. Capital expenditure has been reduced by 50%. Will Santos continue to sink? A year ago a double top formed with a high of $15.32. The closing price today was $4.19, a decline of 72.65% from the high. The major decline was in December 2014 but the first technical inkling of what was to come occurred mid-September 2014 with the breaking of support at $14. Support was found at around $7, and this has held for most of this year until a month ago. 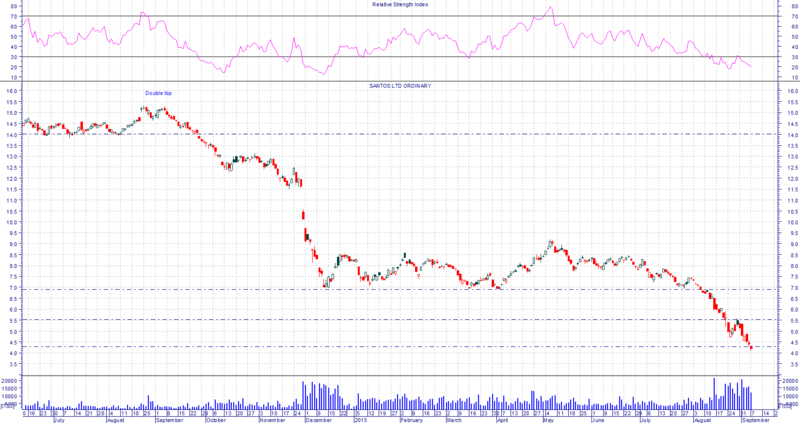 The share-price then fell to the $4 support level. Volume increased as trading reached both support levels. The RSI is in over-sold range. The trend is still downwards, and could fall further before the trend changes. Santos is an energy giant with vast assets of national significance. It is inconceivable that it would fail, or that there would be a fire-sale of its assets. The Energy Sector is capital-intensive, for both exploration and development. In my personal experience Oil and Gas stocks have disappointed in terms of shareholder returns. However at current prices, Santos is likely to be regarded as being a Buy for Deep Value Investors. Retail investors holding Santos or contemplating taking a long position, should seek the opinions of their financial advisers. For the present, in my opinion, there is no technical reason to buy. ‹ BHP Company Review – Buy, Sell or Hold? This is another one of those stocks that gave ample warning of a possible further loss of investor capital. All of the technical analysts could see months ago that a down trend was in place. If only more investors would utilise some of the basic concepts of T/A – they could better protect their capital also.